An amoxicillin rash is usually not severe and often disappears on its own. But any additional signs like itching or vomiting should be reported to doctor. Amoxicillin is an antibiotic in the penicillin family. If you or your child is agitated by penicillin antibiotics it can result in a rash on the skin. It is important to note that an allergic reaction to amoxicillin will not cause a rash to appear. An allergic reaction will cause hives or difficulty breathing. The rash may be a sign that you are suffering from a viral infection in addition to the bacterial infection the medication was used to treat. Rashes usually don't need treatment, but home remedies can be used to speed healing time if necessary. Rashes that are accompanied by other symptoms or those that are slow to heal will need to be addressed by your doctor to ensure that your symptoms are not serious. What Does It Look It? A typical amoxicillin rash will appear as pink or red spots along the skin symmetrically. They will remain on the trunk of the body, but they may spread to the face, arms or lages in more serious cases. These spots should be small, flat or slightly raised and should not itch or cause discomfort. Up to 10 percent of children who are given amoxicillin will experience a rash. 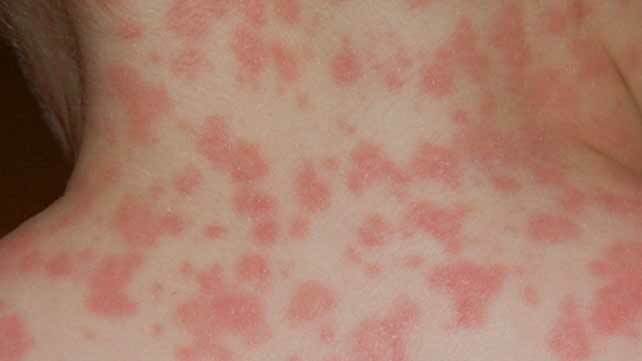 Up to five percent of children who have previously experienced an amoxicillin rash are likely to develop another the next time they take this medication. This rash will typically appear around the 5th day of using the medication, but it can appear as late as the 16th day after being exposed to amoxicillin. Symptoms will typically last around three days, but can range from 1-6 days depending on the severity of the reaction. Pay attention that an amoxicillin rash is usually harmless and usually goes away on its own. But an allergic reaction can be life-threatening and requires different attention. An allergic rash appears in a more sudden manner, usually an hour or two after one takes amoxicillin. It is often accompanied by itching, wheezing, hives, difficulty breathing, swollen face or lips. When these symptoms appear, be sure to get medical attention fast. Watch Out for Additional Symptoms and Infections! Sometimes additional symptoms will accompany an amoxicillin rash. These include chills, fever, headaches, dizziness, heartburn, flu-like symptoms, body aches, nausea, vomiting and watery or bloody stools. These side effects may also be the result of the infection that you are experiencing, but they can also be a sign of an allergic reaction to the medication. Any additional symptoms that accompany your rash should be reported to your doctor. Some patients will develop a yeast infection or infections in the mouth when they experience an amoxicillin rash. This may include the development of swelling and hives in the mouth if the infection is serious. Yeast infections can appear as a "hairy tongue" or white patches throughout the mouth. Vaginal yeast infections may also become more common if you are developing a negative reaction to amoxicillin. In most cases it is not necessary to treat an amoxicillin rash. If the rash is not causing any discomfort it will simply disappear once you or your child finishes their prescription. If at any point, the rash becomes worse you should see a doctor. This includes developing hives or the rash becoming itchy. You should also contact a doctor if the rash lasts longer than six days without any sign of improving. If the rash is causing some discomfort or you are concerned about its presence, some home remedies can be used to treat your condition. Flushing the toxins out of the body can help to alleviate the rash throughout the body. Drink plenty of fluids, especially water to help your body clear toxins from the blood stream more effectively. This will also help rid your body of the bacteria causing your infection. Taking an oatmeal bath can sooth the symptoms associated with an amoxicillin rash. Mixes for an oatmeal bath can often be found at the grocery store or pharmacy. If you cannot find a premixed oatmeal bath, add a cup of oatmeal to a warm bath. Soak in the bathtub for 15-30 minutes as needed to ease your discomfort. Take care when draining the bathtub afterward as the oatmeal can clog your drain if it clumps in the piping. Taking antihistamine medication such as Benadryl can help take down the rash if it is uncomfortable or has lasted for several days. If it becomes necessary to take medication to rid yourself of the effects of the rash, then it may be best to avoid amoxicillin medication in the future. Talk with your doctor about changing your prescription and whether or not you should finish the medication you have left. If you develop watery or bloody diarrhea in addition to your rash, tell your doctor right away. This is especially important if you have stopped taking your mediation and then restarted. It may be a sign that you have developed a more severe bacterial infection that the medication cannot treat. Facial dark spots are not good looking. Remedies like masks can allow them fade quickly. If the dark skin is persistent, you can speak to your doctor.